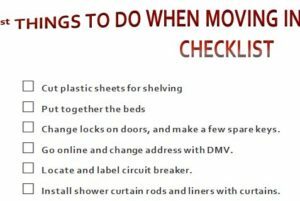 You can use the free “First Things to Do When Moving” template to plan your next move. Let’s face it, there’s a right way and a wrong way to move. The wrong way involves a lot more trips than necessary, damaged items, and a lot of headaches. You can use this free template to ensure all your valuables are safe and secure. The free template is a simple checklist that gives you needed advice to make your move as effortless as possible. To get started with this free template today, just follow the link at the bottom of this page. When you have successfully downloaded the free template file to your computer, you can start customizing the sheet for your own needs. Start by taking a look at the items listed on the template sheet. You want to make sure they apply to you and your items. The second thing you want to do is add your own items to the list. Start at the end of the last item on this list and click the “Enter” button on your keyboard. This will start a new line and make another checkbox for you to use. When you have your own items on the list, you can finally print the sheet for use. To print, press “File” then “Print” at the top of your screen. The next step is to go through your customized list and start checking off items as you complete them. This way, you won’t miss anything when you package fragile items, move heavy objects across wood floors, and much more. You’ll have everything you need to transition to your new home with ease. To try this free template today, just follow the link below.